We still have a few stops left on “Measure and Stir’s Magical Mixological Journey in the Land of the Rising Sun(tm)”, so let’s make them count! 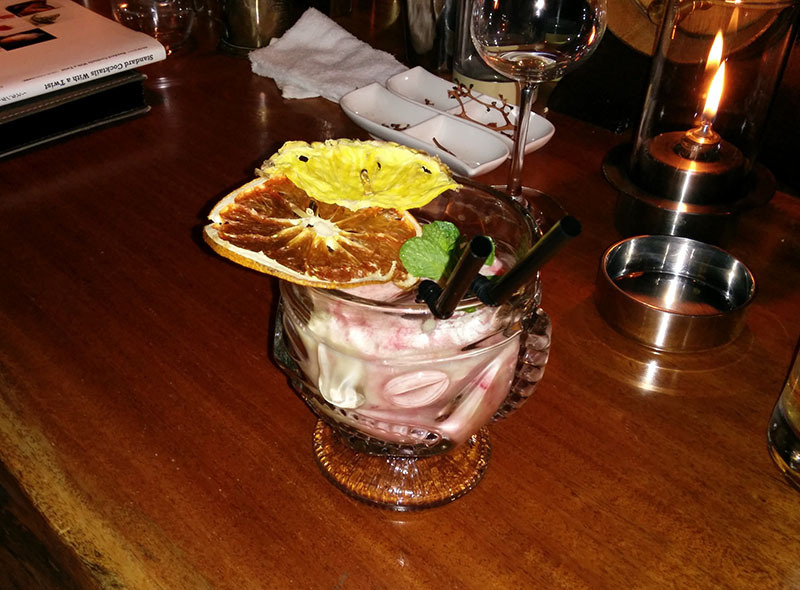 Codename:Mixology has a location in Akasaka, and a location next to Tokyo central station. The one by Tokyo station has standards, apparently, and they wouldn’t let us in. Fortunately, the one in Akasaka was willing to entertain riffraff like us. Before we get into the meat of this article, I would like to note that it is located right next to liquor store that carries Lemonhart of both the regular and the 151 variety, and that sells green chartreuse for 30$/bottle. C:M’s interior was probably my favorite of all the bars on the trip, though it was baroque in its style. As you walk in the door, you are greeted by a rotovape distiller, a freezing centrifuge, and a vaporizer gun, announcing the modernist aspirations of the bar. 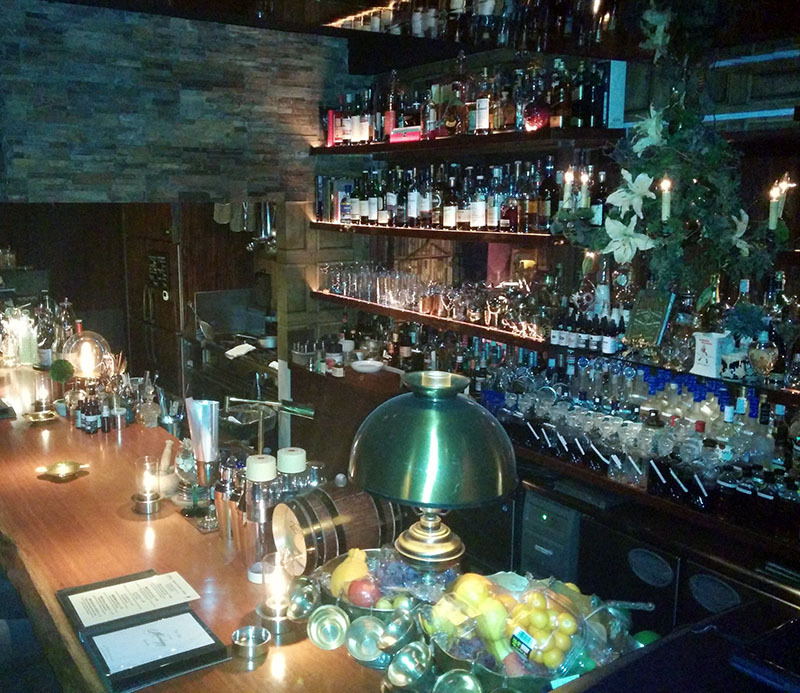 The inside is lavishly decorated with bottles, bitters, ornate barware and leather-bound books. I did not smell any rich mahogany, but then again, I was getting over a cold. C:M had the only bottle of Pappy we saw all trip, and for that matter, their house barrel-aged Manhattan, dubbed “the Manhattan experience” is made with 15-year old Van Winkle rye, Pedro Ximénez sherry, Abbott’s bitters, and a raspberry shrub. I have never had a Manhattan as good as theirs. 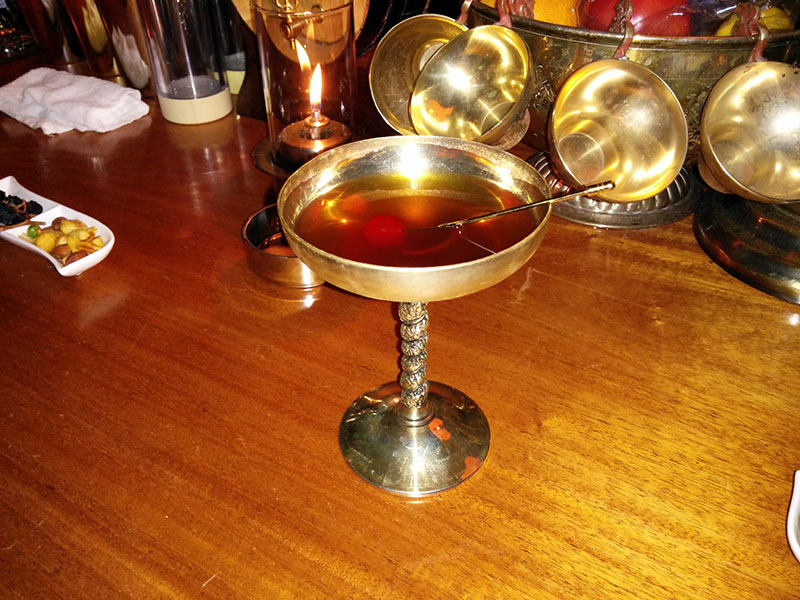 The particular genius of this drink was to barrel-age a shrub. It sounds obvious once you say it, but I had never realized, prior to this drink, that it is possible to barrel-age a maceration of fruit. Since the vinegar in the shrub acts as a preservative, it is possible to make a drink of this nature. And indeed, they have a whole page of barrel-aged drinks, including a mai-tai made with barrel-aged house made mai-tai mix, and a barrel-aged “woodland negroni”, in which a Negroni made with Campari, Amer Picon, and Gin is aged with a house tincture of woodland herbs and spices. The Rotovapor is an instrument used to distill a solvent. The purpose of distillation is to separate a given mixture into its components based on their respective volatilities, through the process of evaporation and condensation. What makes the Rotovapor so fantastic is that it has a vacuum. This allows you to evaporate things at lower boiling points because you are evaporating through pressure rather than heat. This is incredibly useful because the less heat you use, the less likely you are to damage or pull apart the more delicate volatiles of an ingredient. Alcohol is a fantastic medium for carrying flavor and volatile aromas. You can extract the purest and freshest flavors from ingredients by removing the water and replacing it with a solvent such as alcohol, gently and at low temperatures. This means your final product has a full spectrum of aroma and flavor notes. The rotation of the evaporating flask, immersed in a heated water bath, increases the surface area of the product, greatly speeding up distillation and also, through forced convection, keeping the mixture evenly mixed and heated, to promote stable, even evaporation. For example, when distilling rose petals, you have very delicate, small molecules, which too muc hheat would simply burn. With less heat, the delicate molecules are preserved and come through along with the bigger molecules. In this way you have the big picture of what a rose is. What I love about the Rotovapor is that it is one of the most complicated pieces of equipment used in the lab but the products made from it are incredibly poetic. By the way, if you haven’t read Mr. Conigliaro’s book yet, you really ought to check it out. I will have a book review coming shortly. After we each drank a 15 year Van Winkle Manhattan, Dave ordered a “hot bourbon moscow mule” (isn’t that a Kentucky Mule? ), Tom ordered a drink made with roughly equal parts of clarified tomato juice and champagne, and I ordered, in fact, the Blue Cheese martini. The rotovape makes it possible to create distillates at room temperature, so it is possible to distill ingredients such as cheese into a spirit, which would otherwise melt and clog up the still. I am not sure if it sounds appetizing to you, but in fact the flavor of the blue cheese, or at least, the portion of if that was distillable, really did come out in the drink in a unique and delicious way. 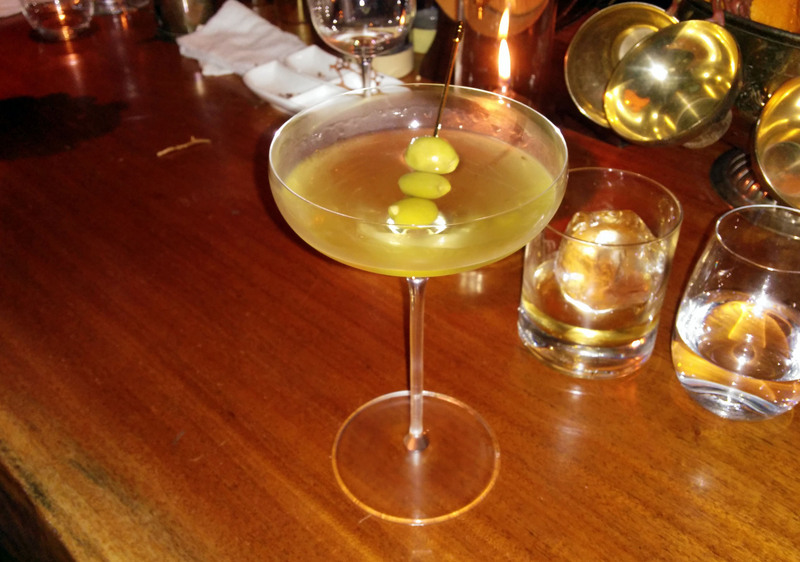 This was the most interesting martini of my life to date. 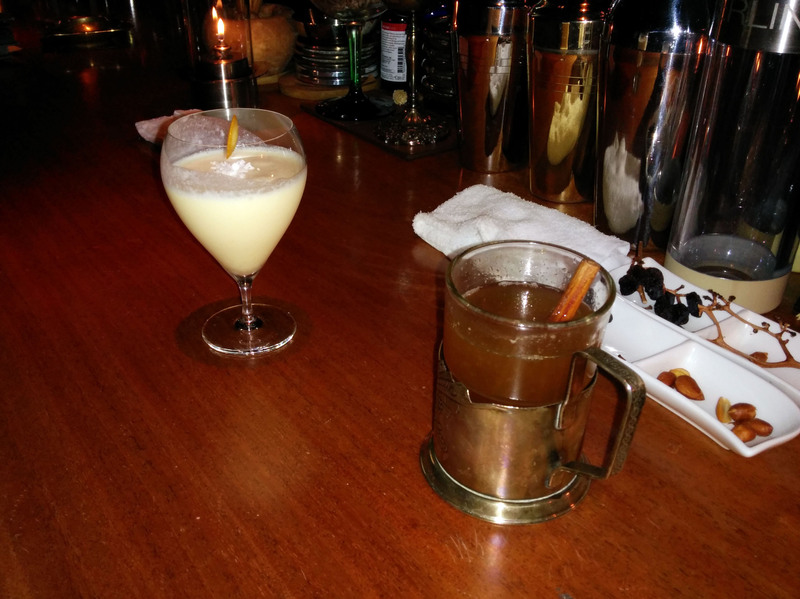 “Hot Moscow Mule” on the right, and I apologize but I can’t remember the drink on the left. Finally, because Dave is a lover of all things tiki, he ordered their mashup of a Piña Colada and a Mai Tai, called “Mai Piña”. To be honest, we both would have preferred if this had been a little more rum-forward, but in true Japanese style, the spirit was soft and light upon the palate. Regardless, that tiki glass is amazing. Codename:Mixology was astonishingly good. Go there. Categories: excursions | Tags: Akasaka, alcohol, bars, bartending, booze, cocktail, cocktails, craft cocktails, drinking, drinks, japan, mixed drinks, mixology, tokyo | Permalink. any dress code requirements? is shorts okay to enter? I would definitely dress a little nicer.